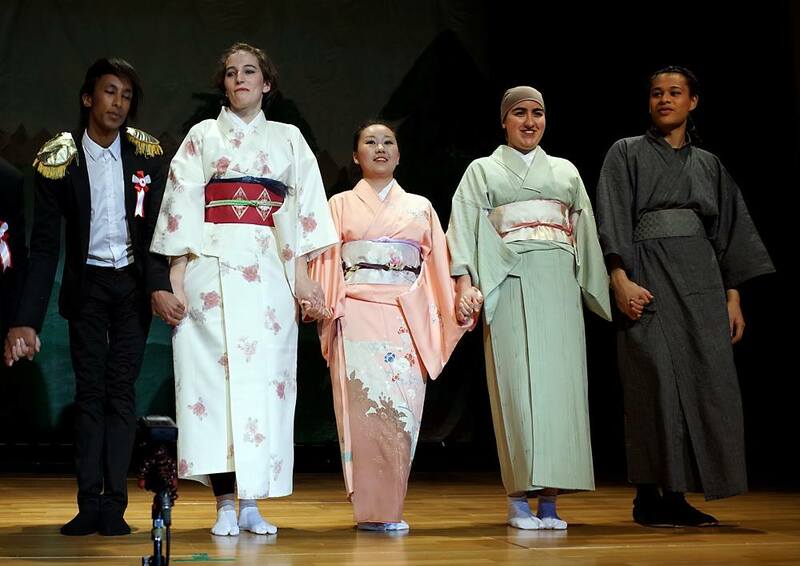 Kitsuke Dressing: The Performances | Ready, Set, Kimono! 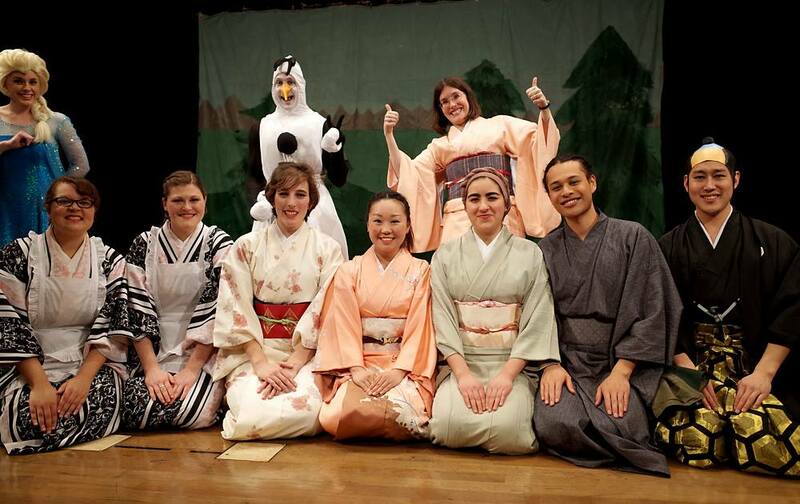 Fifteen chances to dress people in kimono. Hundreds of himo, korin belts, tabi, and other accessories. This has been my life every Saturday and Sunday for the past three weeks. I wrote about this experience earlier here. 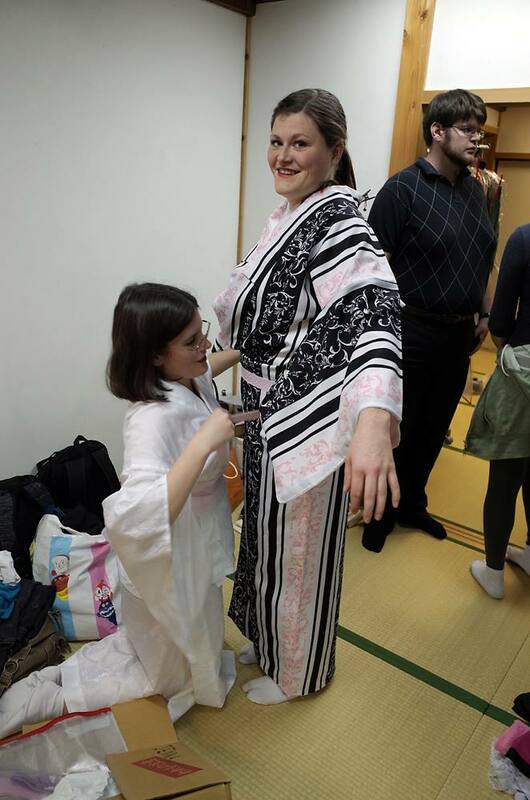 Basically, the foreign community in my area put on an annual English musical, and this year I was the official kimono dresser. 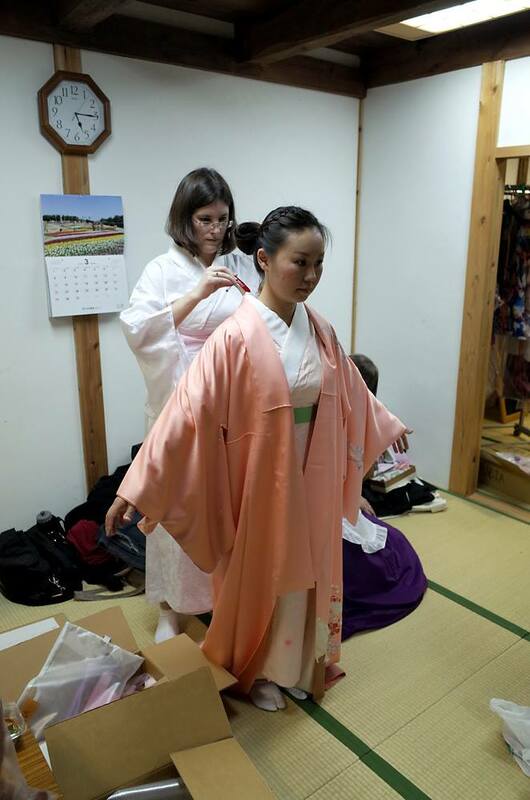 I raided my kimono closet to dress ten people in kimono. Five of those people I had to dress twice during each show, with the shortest turn around time being two minutes. It was exhausting, stressful, but a also a great experience that I’d love to do again. 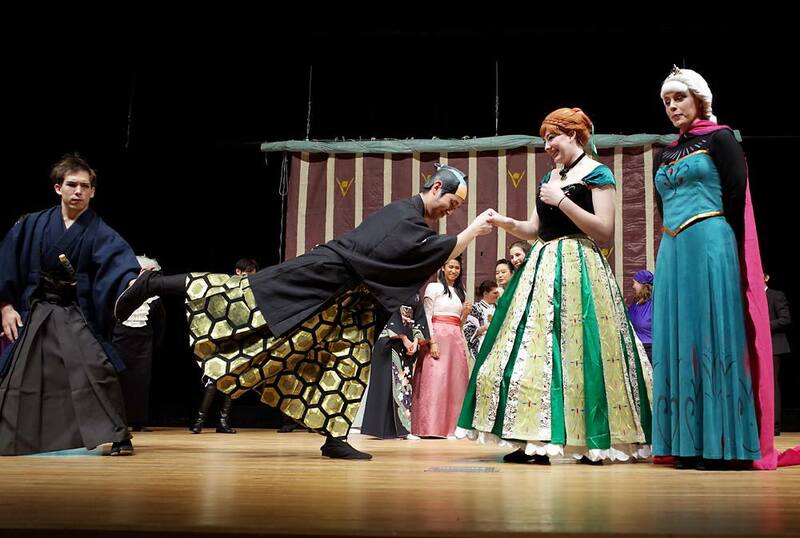 It was great experience in dressing others, and I got really fast at it too! I just wanted to share some of the photos that various people took during the past few weeks. 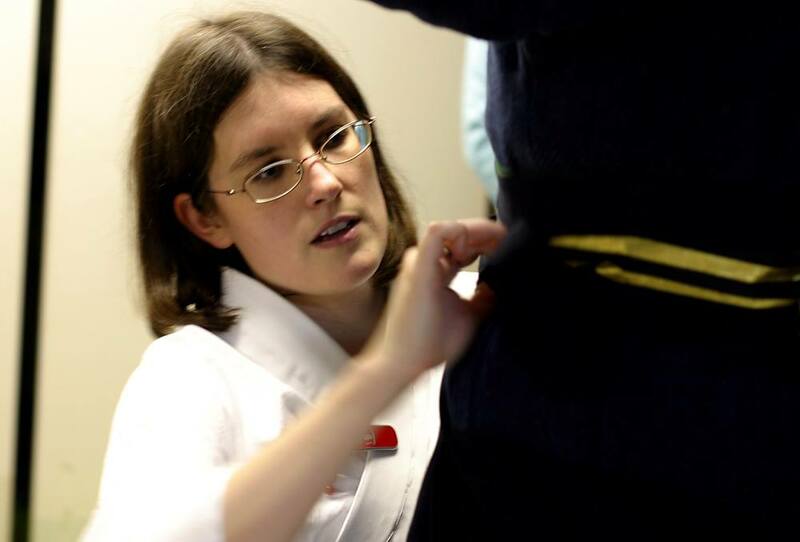 Working on tying hakama. I was half dressed myself when people started to finish with their makeup, so I had to stop dressing myself and start dressing everyone else. She’s so small I have the opposite problem to what I usually have, too much fabric! 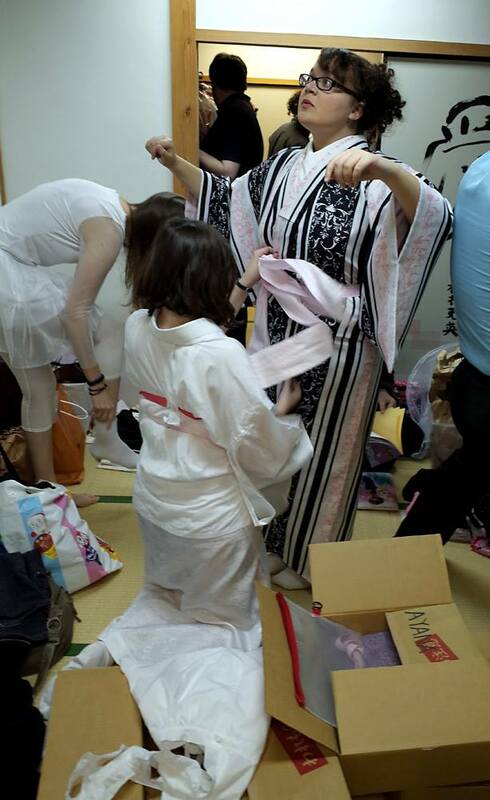 I have to tie the waistbelt around her ribcage for the ohashori to end up in the right place. 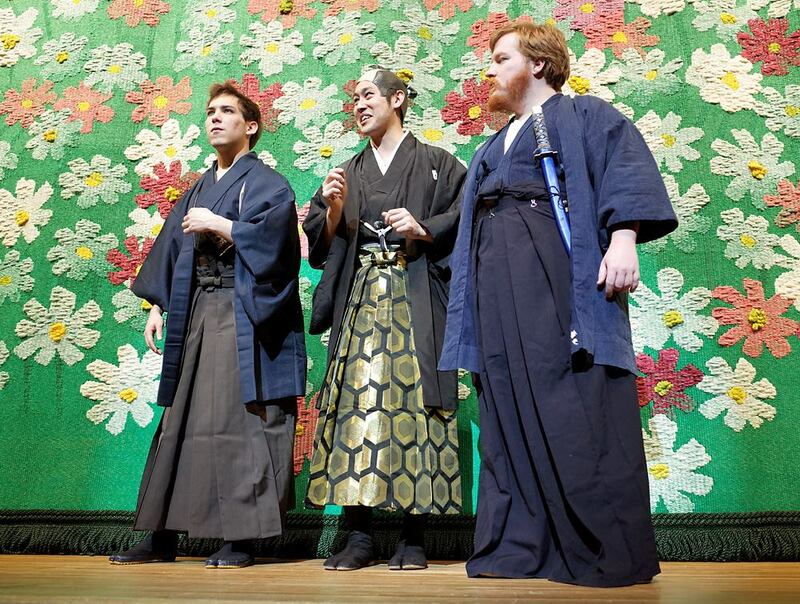 The Daimyo and his bodyguards. 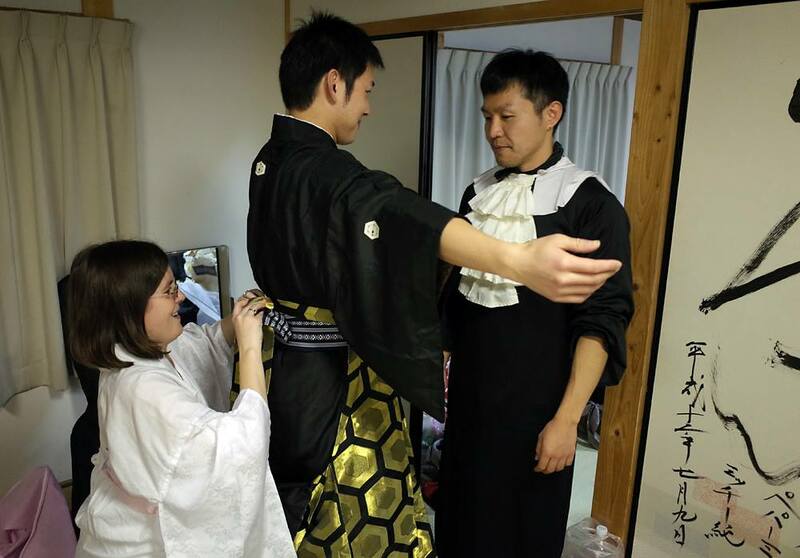 I had to learn how to tie a hakama pretty quickly to dress these three. Four of my kimono people. The three ladies I dressed in eight minutes just before this photo was taken. The hems are a mess, but I’m happy with the collars! Celebrating after a successful show. Just came across your Ig site and this site! Marvelous!!! I’m a big fan of the kimono and been searching how to buy one online without breaking the bank. Nothing too special, i just want to wear on a normal day..and risk getting stares of people here in Dubai! How do I keep in touch with you? Thinking of studying design in Japan but I dont speak the language. Finally found an English site talking about one of my favorite topics in the world.